No sooner had 12 new members taken oath of office that opposition members trooped into the well displaying placards with their demand and shouting slogans. New Delhi: The Rajya Sabha was today adjourned till 2 pm without transacting any legislative business after the Congress-led opposition created uproar over various issues including softening of provisions of the SC/ST Atrocities Act. 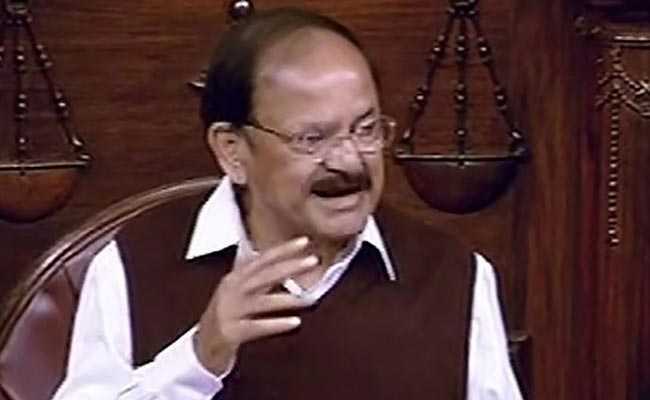 Chairman M Venkaiah Naidu called the protests, which have not allowed any business to be transacted since the House met on March 5, as a "murder of democracy". No sooner had 12 new members taken oath of office that opposition members trooped into the well of the House displaying placards in support of their demand and shouting slogans. While lawmakers belonging to the Congress and the BSP were protesting against softening of certain provisions of the Scheduled Castes and Tribes (Prevention of Atrocities) Act, Tamil parties - DMK and AIADMK demanded immediate constitution of the Cauvery Water Management Board for division of river water between Tamil Nadu and Karnataka. Members of the TDP and KVP Ramachandra Rao of the Congress held placards demanding special status for Andhra Pradesh. "Narendra Modi - Dalit Virodhi" (Narendra Modi is anti- Dalit), shouted Congress and BSP members. They also shouted "Dalit virodhi yeh sarkar, nahi chalegi, nahi chalegi" (This anti-Dalit government will not be tolerated). TDP lawmakers raised "Save Andhra" slogans. Mr Naidu expressed displeasure over repeated disruptions since the parliament met early last month for the second half of the budget session. He requested members to return to their seats and at least pass the anti-corruption bill. "You want these kind of ugly scenes to be seen everyday by people," he said referring to slogan shouting and placards trying to block his view. "What is the difference between people shouting slogans outside and here," he asked. "You have not transacted any business including important legislation. People want legislation." He said a handful of people were obstructing proceedings over their agenda. Mr Naidu said any issue be it banking scam, Cauvery waters, Andhra special package, Dalit act or Kashmir issue can be discussed. It's unfortunate that debate on these issues is not happening despite the Chair permitting it and the government willing to discuss it, he said. "You are testing the patience of the people. This is not good for democracy. This is murdering democracy," he said. "Entire country is agitated, depressed." "Have some discussion and allow some bills to be passed," he requested an unrelenting opposition. He noted that just two days were left before the session ends on Friday and it is imperative that some legislative business is transacted today and tomorrow. When the sloganeering continued, he adjourned proceedings till 2 pm.